What makes Vitality Super Green so special? A powerful blend of energizing, alkalizing, nutrient-rich, whole foods designed to balance, heal, and rejuvenate, Vitality Super Green has a special focus on anti-aging and on nourishing your digestive tract. 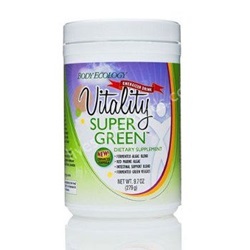 Now enhanced with nutritionally-potent fermented algae and fermented green vegetables, Vitality Super Green provides complete proteins, enzymes, vitamins, minerals, lignans, essential fatty acids, and beneficial microflora. As the leader in fermented foods and nutrition, Body Ecology has a special focus on helping you heal your intestines while creating a perfect environment for the growth of beneficial micro-organisms. This is your best defense against disease, since over 80% of your immune system is centered here. Your gut is also the hub of your physical and emotional wellbeing, since your "abdominal brain," or enteric nervous system, is housed here as well. You must keep this part of your body healthy! We are often told that Vitality Super Green is the best-tasting green drink on the market today. To make it a little sweeter, add a few drops of liquid stevia. Contains no casein or fillers. Start your day with Vitality Super Green and take it again as a quick pick-me-up in the afternoon. Simply add 2 scoops (or more) to 8 ounces of filtered water or young coconut kefir. As part of a high-energy weight-loss program, substitute Vitality Super Green for your breakfast meal. If you want to gain weight, you"ll find Vitality Super Green provides extra nourishment when taken along with larger meals.